I love a lofty mountain. It so constantly allures me. Its steadfast, firm continuance enfolds and reassures me. This love is unattainable, beyond my small control. Its vastness cannot be contained within a human soul. though I can almost touch the sky, I never can belong. the mountain's rugged shoulders are too broad for my embrace. ignoring me, while lavishing affection on its own. and serves it up in bubbling springs to all its forest friends. There's food for all and plenty in the sheltering rocks and trees. The bears roam freely, unconcerned with scolding chickadees. and huckleberry carpets sleep beneath deep winter snows. The deer move, lithe and agile, and scarcely touch the ground. They listen to Eternity, and never make a sound. which, flourishing, returns surprising softness to the earth. imprinted angels in the snow, where deer have watched the night. They've seen the blissful wedding of the Mountain with the Sky. I love these things the mountain loves. This passion fills my heart. So I must love the mountain, even though I'm not a part. I know my love's unanswered, unrequited. Do not grieve. The love I give does not depend on that which I receive. for love is not possession, not diminished by the giving. I can't possess the mountain, for this love will not permit. But someday I'll return to dust, and be possessed by it. From Outside In (Aron Publications, 2009). Jean Aron is a writer and hiker in Pennsylvania. She considers herself much more of a hiker than a poet and, to that end, has a path named after her in Pennsylvania's Rothrock State Forest. Lovely. I am transported by it. I also love the unrequited giving. as well as the way the whole poem held me breathless and ended with unexpected finality. "They listen to Eternity, and never make a sound". What a perfect description of a deer! This is a beautiful poem. 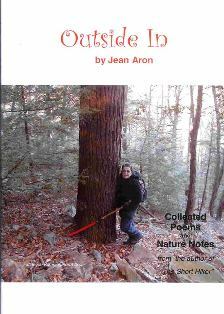 Hike on and be inspired with more great poems, Jean Aron!! I love the imagery, the rhythm, the feeling this poem gives. The last line is perfect. Wonderful poem. This line especially resonates: "The love I give does not depend on that which I receive." A haunting poem. If she's a better hiker than a poet, she must be world-class.